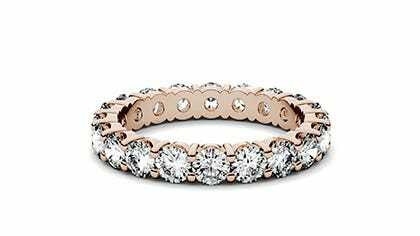 Love lasts more than a lifetime, so why not show that with an eternity ring? Our Forever One eternity bands are the perfect way to symbolize your lasting promise to your loved one and the environment. Flawlessly-created moissanite, wrap around the entire band displaying endless fire and brilliance. Just like the eternal bond you share with your loved one, accentuate your wedding set with never-ending gemstones that will last a lifetime.